As Chicagoland's largest auto recycler, and with over 76 years of experience in the business, ABC Auto Parts is committed to offering the highest quality parts, fastest and friendliest service, and best prices. With our 101-day warranty on all parts, you can rest assured that ABC Auto Parts will be there in case you need us after the sale. Our prices can't be beat, nor can the satisfaction you'll experience when working with our professional staff of individuals who take pride in helping you find the right part. Parts. .
Prices. Pride. Three words that represent what ABC Auto Parts is all about and what you should look for in an automotive recycling center. 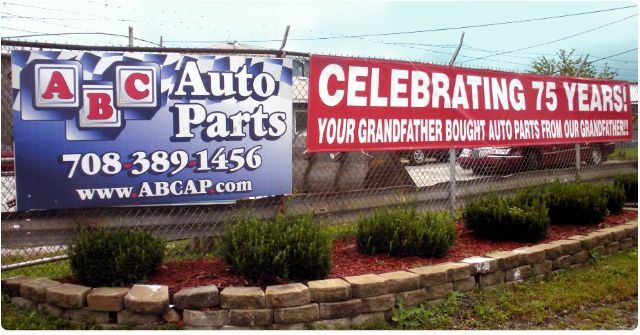 ABC Auto Parts maintains Chicagoland's largest inventory of quality, late-model used parts. We emphasize the word 'Quality' because every part must pass at least three quality control tests before we make it available to you. From our professional parts locator and service staff to our quality-tested used parts, ABC Auto Parts is committed to offering you only the finest service and quality used OEM parts. We believe that our exclusive 101-day warranty on all parts and labor demonstrates our commitment to providing you the right part, at the right price with pride. For more information on how ABC Auto Parts can help you find - and install - the right part for any car, simply call us at 1-800-458-7838 or Email Us.